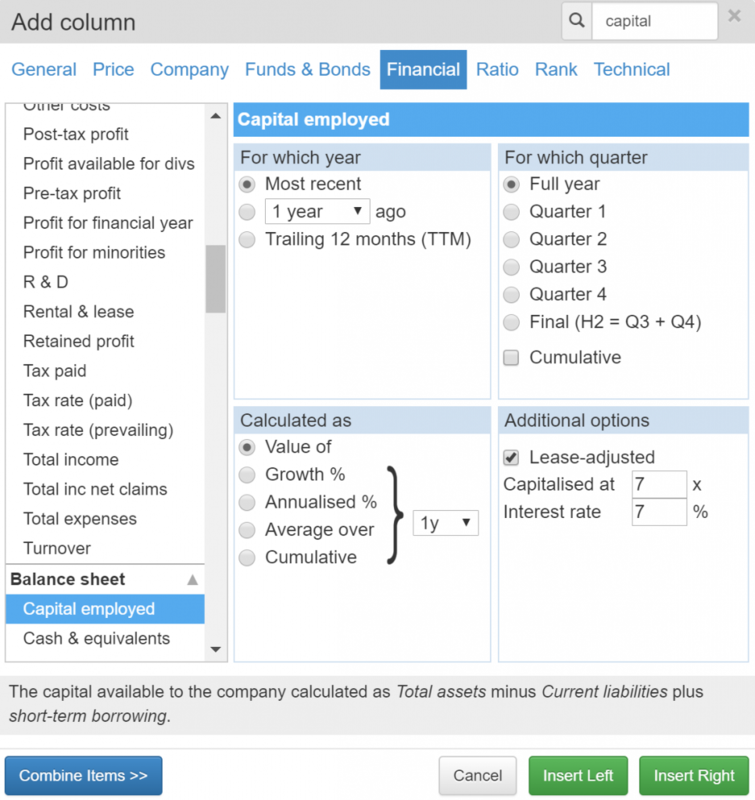 In this article I’ve attempted to find Fundsmith-like companies using SharePad. The results are mixed but there’s a lot to be learned from the experiment. If like me you hold units in Fundsmith, last month you will have received a letter from the fund’s celebrated manager Terry Smith. In publishing an annual letter, Smith is emulating the world’s most famous investor, Warren Buffett, who explains his investment performance and strategy every year. Return on capital is like a company’s interest rate. When you put money in a savings account it earns interest every year, which is added to your savings. Assuming the interest rate is fixed, each year your bank account will be credited with more interest than the year before because you are receiving the same percentage of a bigger amount of savings. This is compound interest in action. Interest is a measure of return. In the context of a company it is synonymous with profit and the interest rate is synonymous with the return on capital, which will in any half-decent company be far higher than the interest rate on a savings account. Such a company will profit more each year, assuming it earns the same return on capital. The firm’s profit and stock market value will compound and, over the long-term, trounce the return from the savings account. This is why Munger and Smith favour tying their money up in high returning companies. But there’s a complication. In the savings account example, I haven’t allowed you to withdraw any money. All your interest has been added to your savings to generate growing returns. It’s rare for a company to reinvest all its profit. 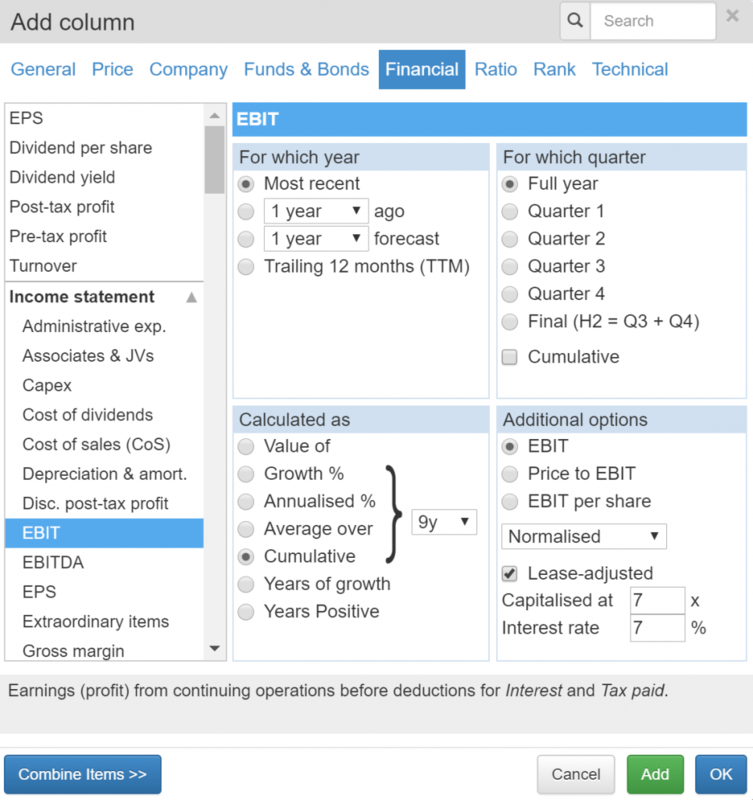 Recently, I showed how James Halstead is paying out about 75% of profit to shareholders as dividends. Assuming it doesn’t borrow or raise more capital on the stock market, it can only reinvest a maximum of 25% of profit. Businesses have other uses for profit too, like buying back shares and paying off debt. I want to put this algorithm to the test, by finding companies that have earned high returns in the past, and seeing if they reinvested heavily. SharePad can process most of our algorithm, and a bit of work in a spreadsheet can do the rest. But first, we need a measure of reinvestment – a reinvestment rate – to find the companies that are compounding their profits. In this experiment, I calculated the reinvestment rate by dividing the increase in capital employed by each company over the last nine years (i.e. how much they invested) by the cumulative total of profit over the same period (i.e. how much they earned) to discover the proportion of profit reinvested. To do this yourself, you need a column for the increase in capital employed. I subtracted the capital employed nine years ago from the capital employed in the most recent year using SharePad’s “combine items” feature, which is at the bottom of the dialog box that enables you to add or edit a table column. Highly cyclical industries that Fundsmith also avoids, like Oil & Gas, Industrials, Utilities and Financials. Companies earning low returns on capital because, as Munger says, if they’re not earning much profit, it doesn’t matter how much they reinvest. Companies earning low cash returns on capital employed because Smith mistrusts accounting profit. 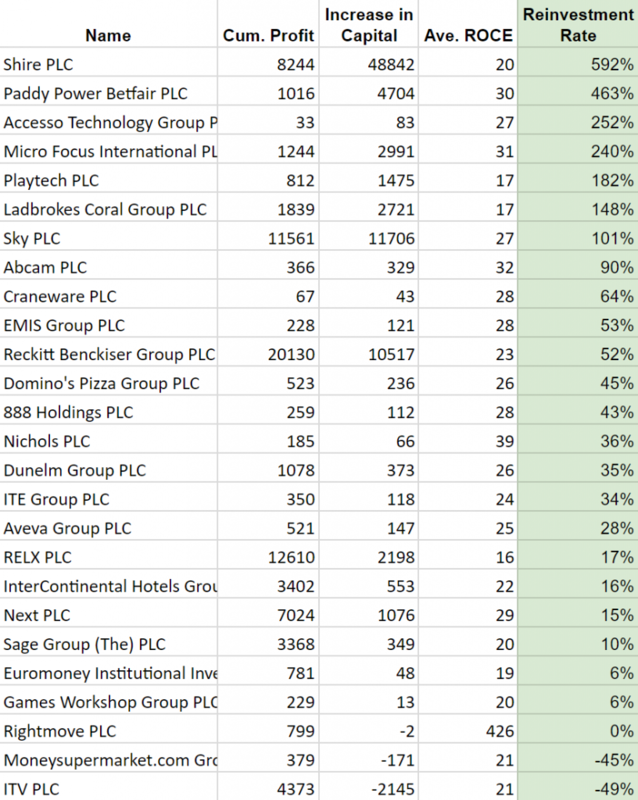 Companies with a market capitalisation of less than £250m, to ensure they are reasonably large and liquid. As you’d expect, it’s a reasonably impressive bunch of shares. Some of them, InterContinental Hotels and Sage, for example, are Fundsmith holdings. 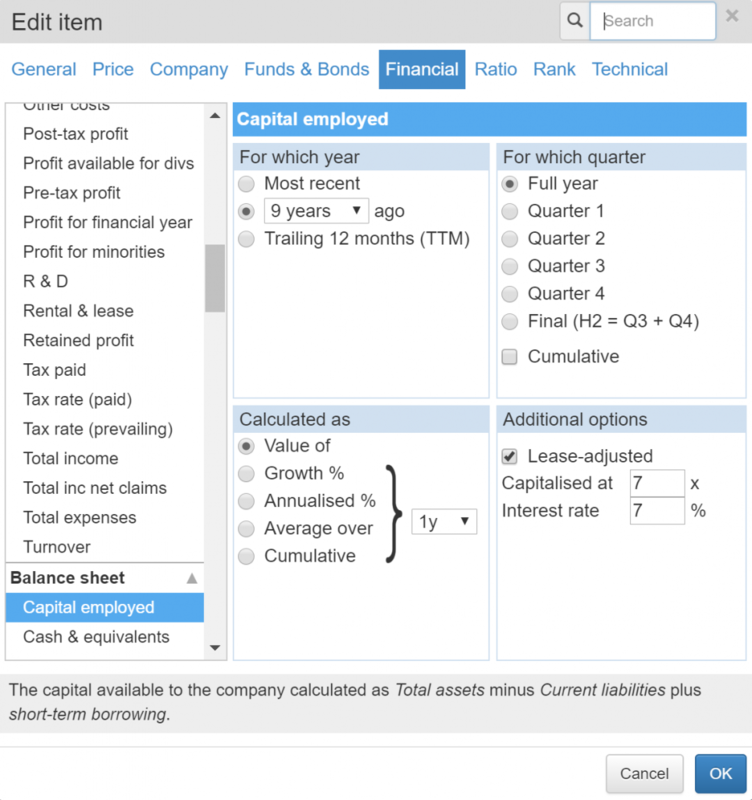 To calculate the reinvestment rate, we must export the table to a spreadsheet where we can divide the increase in capital employed by the cumulative profit. Use the Sharing button in SharePad’s List view. You can view the spreadsheet here but don’t take it too seriously. My experiment is, shall we say, inconclusive. I’m not bitter, we sometimes learn more from our failures. The companies dominating the top of the table have increased capital employed by far more than profit, which has ballooned their reinvestment rates. The results are polluted because they have obviously raised external capital. But there’s a more fundamental problem. 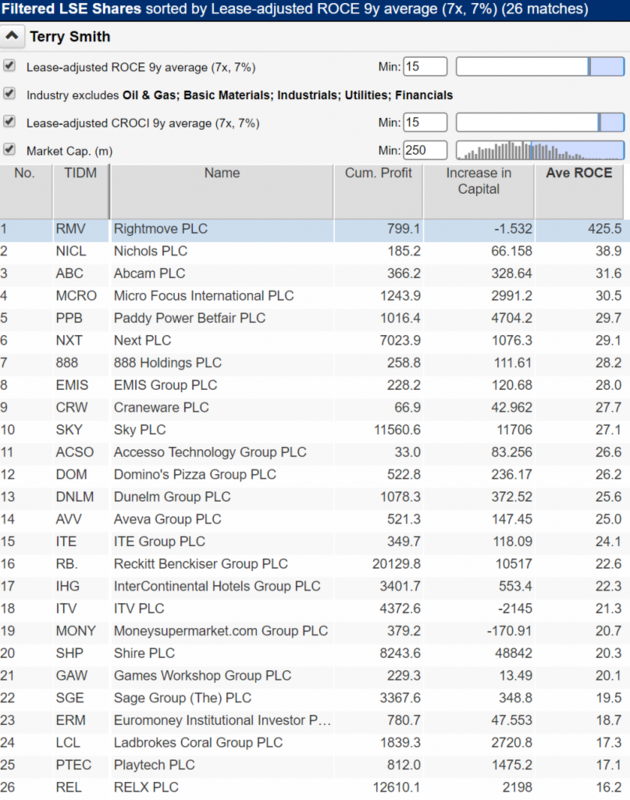 The most profitable company, Rightmove, has moved from the top of the table to near the bottom. Moneysupermarket has been demoted severely too. Both companies actually used less capital in their most recent financial year than they did nine years previously. 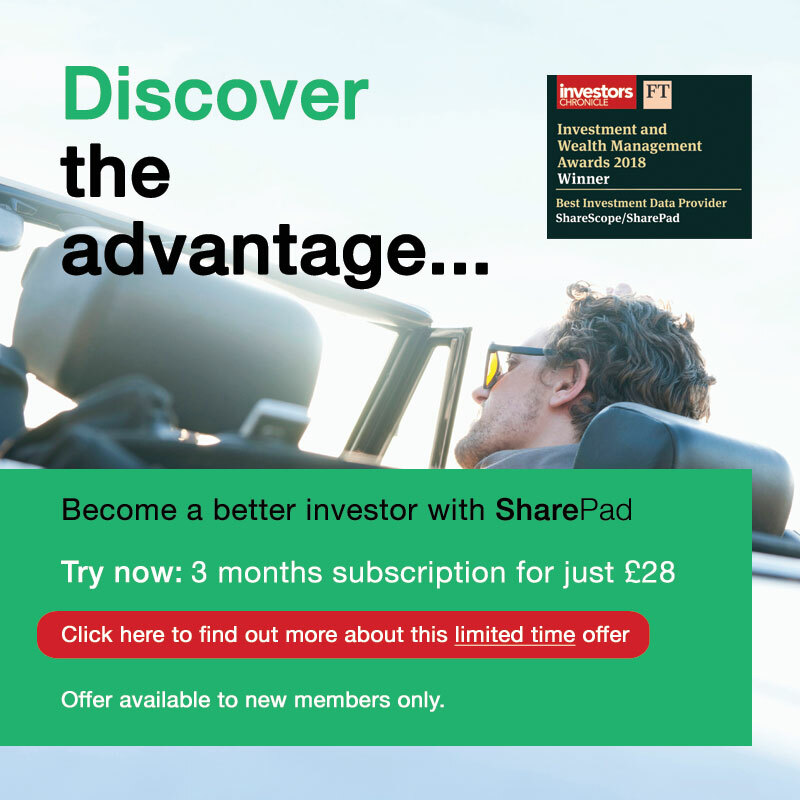 Investing less ought to have crippled growth at these companies, but actually, according to SharePad, Rightmove has achieved an annualised growth rate of 21% over the last nine years, and MoneySupermarket has achieved 27% growth. If we’re looking for compounders that will grow profit, the reinvestment rate as I’ve constructed it doesn’t look like a good way to do it. I suspect the answer lies in the way investment is accounted for. Accounting demands that long term investments, tangible assets like property and machinery, are added to a firm’s balance sheet as capital, while day to day expenses are deducted from profit. A company like Rightmove, which is an online estate agent, doesn’t require much physical investment, but its day to day expenses, like marketing, bring long term benefits. That’s because Rightmove needs to build a strong brand to raise the profile of its website, but a home-grown brand is an intangible asset and accounting regulations forbid companies from recognising it on their balance sheets because it’s so difficult to value. Rightmove is investing, but it’s not in the numbers. I’ve tabled the first part of my question at the AGM later this month. I’ll let you know if I get an answer. *Phil Oakley thinks Smith, like Buffett, may well be investing in companies like Rightmove, that can grow without adding much new capital, although, as I say, they may be investing in other ways. To find these “capital-light” companies, he says, he prefers to use a variant of Return on Capital called Incremental Return on Capital, which compares the change in profit over a certain period to the change in capital over the same period. He introduced this concept in a recent article.